hier startet jetzt der Thread für FRU zum nachlesen. Freehold Royalties Ltd. has released second quarter results for the period ended June 30, 2016. (3) A conversion of natural gas to barrels of oil equivalent. The board of directors has declared a dividend of four cents per share, to be paid on Sept. 15, 2016, to shareholders of record on Aug. 31, 2016. The dividend is designated as an eligible dividend for Canadian income tax purposes. Effective with the August dividend, the board has approved the suspension of the company's dividend reinvestment plan (DRIP) pending further notice. As of Sept. 15, 2016, shareholders who were enrolled in the DRIP will receive the regular monthly cash dividend of four cents per share. Participants in the DRIP will still receive shares in lieu of the monthly cash dividend to be paid on Aug. 15, 2016, to shareholders of record as at July 31, 2016. Freehold's production averaged a record 12,041 barrels of oil equivalent per day in second quarter 2016. Gains in production were the result of acquisition activity (see news release dated May 25, 2016) and a strong quarter from the company's audit function (largely responsible for 475 boe per day of prior-period adjustments for second quarter 2016). Funds from operations totalled $24.1-million (23 cents per share) in second quarter 2016, up 55 per cent from first quarter 2016. Royalties accounted for 91 per cent of operating income, reinforcing the company's royalty focus. Freehold acquired royalty production and fee lands from certain affiliates of Husky Energy Inc. for $162-million. Freehold's royalty acreage now totals 5.9 million acres (73-per-cent increase). After a review of company's prospect inventory, including the upside from the Husky transaction, the company estimates that it has greater than 10 years of free drilling on its royalty lands. In second quarter 2016, Freehold issued 15 leases, with the majority of the interest focused on Freehold's southeast Saskatchewan royalty lands. Basic payout ratio (dividends declared and funds from operations) for second quarter 2016 totalled 55 per cent while the adjusted payout ratio (cash dividends plus capital expenditures and funds from operations) for the same period was 50 per cent. At June 30, 2016, net debt obligations totalled $98.2-million, down $51.0-million from $149.2-million at March 31, 2016. This implies a ratio of net debt to 12-month trailing funds from operations of 1.1 times (0.9 times including the pro forma effects of acquisitions). The attached key operating assumptions table summarizes the company's key operating assumptions for 2016, updated to reflect actual statistics for the first six months and the company's current expectations for the rest of the year. The company has increased its production guidance from 11,400 barrels of oil equivalent per day to 11,700 boe per day, reflecting lower-than-expected decline within the company's royalty production and positive prior-period adjustments. Volumes are expected to be weighted approximately 59 per cent oil and natural gas liquids and 41 per cent natural gas. It continues to maintain its royalty focus with royalty production accounting for 80 per cent of forecasted 2016 production and 93 per cent of operating income. The company has revised upward its 2016 AECO natural gas price assumption from $1.80 per thousand cubic feet to $2 per thousand cubic feet. Increased expected royalty production, which has no operating costs, has resulted in a downward revision to the company's operating costs from $4 per boe to $3.75 per boe. The company's general and administrative costs have been reduced from $2.50 per boe to $2.40 per boe, reflecting the increased production guidance. Freehold's board has approved the suspension of the DRIP pending further notice, resulting in estimates for the company's dividends paid in shares for the full year decreasing from $8-million to $5-million. The company's capital spending budget remains at $7-million. A large percentage of the company's capital expenditure program is non-operated, and the activity level is difficult to predict. Weighted-average shares outstanding have increased from 109 million to 110 million due to the full exercise of the overallotment option relating to the company's May, 2016, financing. Based on the announced DRIP suspension and changes to certain operating assumptions, the company forecasts its 2016 basic payout ratio to be approximately 74 per cent (previously 82 per cent). The company forecasts year-end net debt to funds from operations of approximately 1.1 times based on its revised key operating assumptions (excluding the pro forma effects of acquisitions). (1) Excludes share-based and other compensation. Recognizing the cyclical nature of the oil and gas industry, the company continues to closely monitor commodity prices and industry trends for signs of changing market conditions. The company cautions that it is inherently difficult to predict activity levels on its royalty lands since it has no operational control. As well, significant changes (positive or negative) in commodity prices (including Canadian oil price differentials), foreign exchange rates or production rates may result in adjustments to the dividend rate. Based on the company's current guidance and commodity price assumptions, and assuming no significant changes in the current business environment, the company expects to maintain the monthly dividend rate through the next quarter. It will continue to evaluate the commodity price environment and adjust the dividend levels as necessary (subject to the quarterly review and approval of the company's board of directors). Freehold's second quarter 2016 interim unaudited condensed consolidated financial statements and accompanying management's discussion and analysis are being filed today with Canadian securities regulators and will be available at SEDAR and on the company's website. Freehold Royalties Ltd.'s board of directors has declared a dividend of four cents per common share to be paid on Aug. 15, 2016, to shareholders of record on July 31, 2016. These dividends are designated as eligible dividends for Canadian income tax purposes. Freehold Royalties Ltd. has declared a dividend of four cents per common share to be paid on July 15, 2016, to shareholders of record on June 30, 2016. Including the June 15, 2016, payment, the 12-month trailing cash dividends total 76 cents per common share. Freehold Royalties Ltd. has closed its previously announced $165-million acquisition of royalty production and mineral title lands from Husky Energy Inc. and certain of its affiliates. In conjunction with the closing of the Husky transaction, Freehold also completed its previously announced bought deal financing, issuing 16,428,900 common shares at a price of $11.55 per share for gross proceeds of approximately $190-million, which included the full exercise of the overallotment option granted to the underwriters. The bought deal offering was completed through a syndicate of underwriters co-led by RBC Capital Markets, CIBC and TD Securities. Concurrent with the closing of the bought deal financing, the pension trust funds for employees of Canadian National Railway Company invested approximately $20-million in Freehold through the purchase of 1,732,000 common shares at the issue price on a non-brokered private-placement basis. The total gross proceeds raised by Freehold pursuant to the bought deal financing and the investment by the CN pension trust funds totalled approximately $210-million. Freehold used a portion of the net proceeds from the bought deal financing and investment by the CN pension trust funds to complete the Husky transaction with the remainder to pay down a portion of outstanding indebtedness. Freehold Royalties Ltd. has released first quarter results for the period ended March 31, 2016. The Board of Directors has declared a dividend of $0.04 per share, to be paid on June 15, 2016 to shareholders of record on May 31, 2016. The dividend is designated as an eligible dividend for Canadian income tax purposes. Including the June 15, 2016 payment, the 12-month trailing cash dividends total $0.81/share. Production for Q1-2016 averaged 11,974 boe/d, a 19% increase over Q1- 2015 and a 1% increase over Q4-2015. Royalties accounted for 97% of operating income and 79% of production, reinforcing our royalty focus. Royalty production was up 33% compared to Q1-2015, averaging 9,495 boe/d. Growth in volumes was associated with a combination of production acquired through the year, new production from drilling on our royalty lands and a strong quarter from our audit function; which was largely responsible for approximately 600 boe/d of prior period adjustments, including compensatory royalties on our mineral title lands. Working interest production averaged 2,479 boe/d for the quarter, down 14% when compared to the same period last year, reflecting reduced spending through a weaker commodity price environment. Funds from operations totaled $15.5 million ($0.16/share) in Q1-2016, down 29% from the same period last year owing to continued weakness in oil and natural gas prices. Though average commodity price realizations decreased 25%, reduced revenues were partly offset by the increase in production volumes, resulting in a 10% decrease in gross revenue compared to Q1-2015. Q1-2016 net loss was $8.6 million (Q1-2015 net income of $21.6 million - without a $24.3 million gain on corporate acquisition it would have been a $2.7 million net loss) primarily due to lower revenues and increased depletion and depreciation expense as a result of higher production volumes. Dividends declared for Q1-2016 totaled $0.18 per share, down from $0.27 per share one year ago. On March 3, 2016, Freehold adjusted its monthly dividend to $0.04 per share from $0.07 per share as a result of reduced funds from operations within the weak commodity price environment. Average participation in our dividend reinvestment plan (DRIP) was 11% (Q1-2015 - 35%). DRIP proceeds for Q1-2016 totaled $2.4 million. Net capital expenditures on our working interest properties totaled $2.1 million over the quarter. Basic payout ratio (dividends declared/funds from operations) for Q1- 2016 totaled 115% while the adjusted payout ratio (cash dividends plus capital expenditures/funds from operations) for the same period was 132%. However, based on our 2016 key operating assumptions our current dividend level remains well funded with our basic payout ratio expected to total approximately 82% for 2016. At March 31, 2016, net debt obligations totaled $149.2 million, up $2.3 million from $146.9 million at December 31, 2015. This implies a net debt to 12-month trailing funds from operations ratio of 1.5 times (excluding the proforma effects of acquisitions). On May 2, 2016, Freehold entered into a definitive agreement with certain affiliates of Husky Energy Inc. to acquire an extensive suite of royalty production and fee lands for an aggregate purchase price of $165 million, prior to normal closing adjustments (the Husky Transaction). The effective date of the Husky Transaction is January 1, 2016, with closing expected to occur on or about May 25, 2016, subject to regulatory approval and certain other closing conditions. Adds approximately 2.5 million acres of royalty lands (including 0.3 million acres of mineral title land), increasing our royalty lands acreage by 74% to 5.9 million acres. Expected 2016 annualized average royalty production of 1,700 boe/d and annualized operating income of $11.4 million. Expected to increase royalties as a percentage of 2016 operating income to approximately 94%. The production base is expected to have a low decline of approximately 17% per year in 2016. The Husky Transaction will be funded by a concurrent $165 million public equity financing (before 15% over-allotment option and underwriters' fees) and an approximate $20 million concurrent private placement to CN Pension Trust Funds, with remaining funds allocated to debt repayment. 16,018,000 common shares at a price of $11.55 per share will be issued through the financings (excluding potential effects of the over-allotment option). If the over-allotment option is exercised in full by the underwriters an additional 2,142,900 common shares will be issued at a price of $11.55 per share for gross proceeds of approximately $25 million. The underwriters will receive a commission of 4% on the common shares issued pursuant to the financing (other than the common shares issued pursuant to the concurrent private placement). Two of Freehold's long standing directors, Nolan Blades (Chair of the Board) and David Sandmeyer are not standing for re-election and after 19 years of service will retire from the Board at the Annual and Special Meeting of Shareholders (the Meeting) being held May 11, 2016. Mr. Blades joined the Board in 1996 and was appointed Chair of the Board in May 2009. Mr. Sandmeyer was appointed to the Board in 1996 and served as President and Chief Executive Officer of Rife Resources Ltd. and Freehold until his retirement in May 2009. We would like to thank them for their dedication, wisdom and leadership throughout their tenure on the Board. It is planned that Marvin Romanow will succeed Mr. Blades as Chair of the Board following the Meeting. Mr. Romanow has over 30 years of experience in the oil and gas industry. We are pleased to announce that Douglas Kay has agreed to stand for election at the Meeting. Mr. Kay is a Corporate Director and former oil and gas executive with over 35 years industry experience. The table below summarizes our key operating assumptions for 2016, updated to reflect actual statistics for the first three months and our current expectations for the remainder of the year. The assumptions and guidance reflects the Husky Transaction and the financings (before over-allotment option) discussed in Subsequent Events. -- The increase in our production guidance on May 2, 2016 from 9,800 boe/d to 11,400 boe/d was a function of the Husky Transaction, higher than expected drilling activity on our royalty lands, lower than expected shut-in heavy oil volumes and positive prior period adjustments. Volumes are expected to be weighted approximately 59% oil and natural gas liquids (NGL's) and 41% natural gas. We continue to maintain our royalty focus with royalty production accounting for 80% of forecasted 2016 production and 94% of operating income. -- We have increased our WTI and WCS pricing to US$40.00/bbl and $34.00/bbl respectively (previously US$35.00/bbl and $31.00/bbl respectively), due to recent price momentum. We have revised downward our 2016 AECO natural gas price assumption from $2.00/mcf to $1.80/mcf. -- Based on our key operating assumptions, we forecast our 2016 basic payout ratio to total approximately 82%. -- Operating costs have been reduced from $4.75/boe to $4.00/boe as a result of increased royalty production as a percentage of total production. -- Our capital spending budget remains at $7 million. -- G&A costs have decreased to $2.50/boe as a result of production added through the Husky Transaction, offset somewhat by expected acquisition integration costs -- Weighted average shares outstanding have increased due to the financings detailed in Subsequent Events. other assumptions were changed at that time. (2) Excludes share based and other compensation. Based on our current guidance and commodity price assumptions, and assuming no significant changes in the current business environment, we expect to maintain the current monthly dividend rate through the next quarter. We will continue to evaluate the commodity price environment with the expectation to increase dividend levels as the environment stabilizes or improves (subject to the quarterly review and approval of our Board of Directors - see Dividend Policy). Freehold's 2016 first quarter interim unaudited condensed consolidated financial statements and accompanying Management's Discussion and Analysis (MD&A) are being filed today with Canadian securities regulators and will be available at www.sedar.com and on our website. FRU - liest sich ganz ordentlich! Freehold Royalties Ltd. has entered into a definitive agreement with Husky Energy Inc. to acquire an extensive suite of royalty production and lands for an aggregate purchase price of $165-million, prior to normal closing adjustments. The effective date of the transaction will be Jan. 1, 2016, with closing expected to occur on or about May 25, 2016, subject to regulatory approval and certain other closing conditions. The transaction will be financed by a $165-million bought deal equity financing led by RBC Capital Markets, CIBC and TD Securities Inc. on behalf of a syndicate of underwriters plus a $20-million concurrent private placement to CN Pension Trust Funds (as defined below). The acquisition of the Husky Assets will significantly enhance the Company's existing royalty asset base, adding an expected 1,700 boe/d (70% natural gas) of 2016 annualized royalty production and $11.4 million of 2016 annualized operating income (62% from oil and natural gas liquids). The Transaction is expected to increase royalties as a percentage of 2016 funds from operations to 94%. Freehold's total fee lands will increase by 47% to approximately 1.0 million acres, while total royalty lands will increase by 74% to approximately 5.9 million acres. Freehold sees considerable upside through the addition of southeast Saskatchewan and Deep Basin assets while establishing a new key area in southwest Saskatchewan through the development of the Shaunavon oil trend. The Transaction is expected to be approximately 2% accretive to 2016 funds from operations per share (on an annualized basis excluding one-time G&A integration costs and based on 100% equity financing). Based on the equity financing details described below and our latest production guidance, Freehold's 2016 expected net debt to funds from operations and basic payout ratio (including DRIP proceeds) improves to an estimated 1.7 times and 82%, respectively. The Husky Assets' production base has a low decline of approximately 17% per year. Low counterparty risk is driven by a portfolio of well-established producers with a long history of development in Western Canada. Assuming closing of the Transaction, Freehold has increased its 2016 average production guidance to 11,400 boe/d (previously 9,800 boe/d). The increase in production guidance reflects the additional production associated with the Husky Assets (approximately 1,000 boe/d in 2016 from the expected closing date of May 25, 2016 until the end of 2016) plus an increase in expected 2016 production (approximately 600 boe/d) associated with active drilling on our royalty lands in the first quarter of 2016, lower than expected shut-in heavy oil volumes and positive prior period adjustments. Freehold expects to release its Q1 2016 results after market on May 11, 2016, where it will provide further disclosure on operating and financial assumptions for 2016. Freehold has entered into an agreement with RBC Capital Markets, CIBC and TD Securities, on behalf of a syndicate of underwriters, to issue, on a bought deal basis, 14,286,000 common shares at a price of $11.55 per share (the "Issue Price") for gross proceeds of approximately $165 million pursuant to the Public Offering. Freehold has also granted the underwriters an over-allotment option to purchase, on the same terms, up to an additional 2,142,900 common shares at the Issue Price. The over-allotment option is exercisable by the underwriters, in whole or in part, at any time for a period of 30 days following the closing of the Public Offering. Concurrent with the closing of the Public Offering, the pension trust funds for employees of Canadian National Railway Company ("CN Pension Trust Funds") intend to purchase approximately 1,732,000 common shares on a non-brokered private placement basis at the Issue Price for gross proceeds of approximately $20 million pursuant to the Private Placement. The aggregate gross proceeds to be raised by the Company pursuant to the Financing will be approximately $185 million before giving effect to any exercise of the over-allotment option by the underwriters. If the underwriters exercise the over-allotment in full, the aggregate gross proceeds to be raised by the Company pursuant to the Financing will be approximately $210 million. Freehold expects to use the net proceeds from the Financing to complete the Transaction and the remainder to pay down a portion of its outstanding indebtedness. Completion of the Financing is subject to certain conditions including customary regulatory and stock exchange approvals. In addition, the Public Offering will require that the Transaction close at or before the closing time of the Public Offering unless otherwise agreed to by the underwriters and Freehold. The common shares to be sold under the Public Offering will be offered in all provinces of Canada (excluding Quebec) by way of a short form prospectus. The closing of the Financing is expected to occur on or about May 25, 2016, but in any event before May 31, 2016. Freehold's management will hold a conference call and webcast on May 2, 2016 at 4:45 p.m. EST (2:45 p.m. MT) to present the Transaction. A transcript of the broadcast will be posted on the website once it becomes available. Leider senkt FRU die monatliche Dividende, weiter Kosten gesenkt! Freehold Royalties Ltd. has released its 2015 fourth-quarter results and reserves as at Dec. 31, 2015. (1) See Additional GAAP Measures and Non-GAAP Financial Measures. Reflecting continued weakness in commodity prices, Freehold's Board of Directors has approved an adjustment to its monthly dividend to $0.04 per share from $0.07 per share. The Board of Directors has declared a dividend of Cdn. $0.04 per common share to be paid on April 15, 2016 to shareholders of record on March 31, 2016. Including the April 15 payment, our 12-month trailing cash dividends total $0.91 per share. This dividend is designated as an eligible dividend for Canadian income tax purposes. The dividend reduction aligns with a lower for longer commodity outlook. Freehold's goal is not to pay dividends with debt, thus maintaining strength within our balance sheet and ensuring the long term success of our business model. Freehold will continue to evaluate dividend levels on a quarterly basis, with the expectation to increase dividend levels as funds from operations improve. -- Production for Q4-2015 averaged 11,815 boe/d, a 20% increase over Q4- 2014 and a 5% increase over Q3-2015. -- Royalties accounted for 89% of operating income and 78% of production, reinforcing our royalty focus. -- Royalty production was up 26% compared to Q4-2014 averaging 9,249 boe/d. Growth in volumes was associated with a combination of production acquired through the year, new production from drilling on our royalty lands and a strong quarter from our audit function, including compensatory royalties on our mineral title lands, largely responsible for approximately 500 boe/d of prior period adjustments. -- Working interest production averaged 2,566 boe/d for the quarter, up 2% when compared to the same period last year. -- Funds from operations totalled $25.5 million ($0.26/share) in Q4-2015, down 17% from the same period last year owing to continued weakness in oil and natural gas prices. -- Though average commodity price realizations decreased 36% reduced revenues were partly offset by the increase in production volumes, resulting in a 22% decrease in gross revenue compared to Q4-2014. -- Q4-2015 net loss was $7.4 million (Q4-2014 net income $11.1 million) primarily due to a non-cash impairment charge of $8.0 million in our southeast Saskatchewan working interest area, as a result of the continued drop in expected future commodity prices. Lower revenues and higher depletion and depreciation also contributed to the difference. -- Dividends declared for Q4-2015 totalled $0.21 per share, down from $0.42 per share one year ago due to the reduction in funds from operations resulting from lower commodity prices. -- Average participation in our dividend reinvestment plan (DRIP) was 13% (Q4-2014 - 35%). DRIP proceeds for 2015 totalled $17.2 million. -- Net capital expenditures on our working interest properties totalled $5.6 million over the quarter. -- Basic payout ratio (dividends declared/funds from operations) for 2015 totalled 87% while the adjusted payout ratio (cash dividends plus capital expenditures/funds from operations) for the same period was 95%. -- At December 31, 2015, net debt totalled $146.9 million, down $2.1 million from $149.0 million at September 30, 2015. This implies a net debt to 12-month trailing funds from operations ratio of 1.4 times (excluding the proforma effects of acquisitions). The table below summarizes our key operating assumptions for 2016. -- Despite lower spending on our working interest and royalty lands, we have not revised our 2016 production forecast (9,800 boe/d). Volumes are expected to be weighted approximately 62% oil and natural gas liquids (NGLs) and 38% natural gas. We continue to maintain our royalty focus with royalty production accounting for 78% of forecasted 2016 production and 94% of operating income. -- Continuing negative momentum in the commodity environment has resulted in a downward revision to our price assumptions. Through 2016, we are now forecasting WTI and WCS prices to average US$35.00/bbl and $31.00/bbl, respectively (previously US$50.00/bbl and $47.00/bbl). Our AECO natural gas price assumption has also been revised downwards to $2.00/mcf (previously $2.75/mcf). -- The Canadian/U.S. exchange rate has been adjusted downwards to $0.72 (previously $0.76), reflecting the recent declining valuation of the Canadian dollar relative to the United States dollar. -- Operating costs have been reduced to $4.75/boe from $5.00/boe representing an increasing portion of our production coming from royalties, which have no operating costs. -- We have revised our general and administration expense to $2.65/boe from $2.85/boe, as a result of cost reduction initiatives. -- Our capital spending budget has been reduced from $15 million to $7 million reflecting the weaker commodity outlook. A large percentage of our capital expenditures program is non-operated and the exact capital is difficult to predict. We expect to have additional information on the spending of our partners as we move through the year. Freehold Royalties Ltd. has exceeded its 2015 production guidance of 10,600 barrels of oil equivalent per day with volumes averaging 10,945 barrels of oil equivalent per day for the year. Fourth quarter 2015 volumes averaged 11,815 barrels of oil equivalent per day. Freehold will be reporting its fourth quarter and year-end 2015 operating and financial results after market on March 3, 2016. Nach dem ich hier im Board schon Valeura Energy vorgestellt habe, möchte ich heute einen weiteren Ölwert vorstellen. Hier steht mehr der Fokus Langfristinvestment in Öl! Das Unternehmen zahlt monatlich eine Dividende von 0,07 CAD$, was aktuell eine Dividendenrendite von ca. 7,8% entspricht! 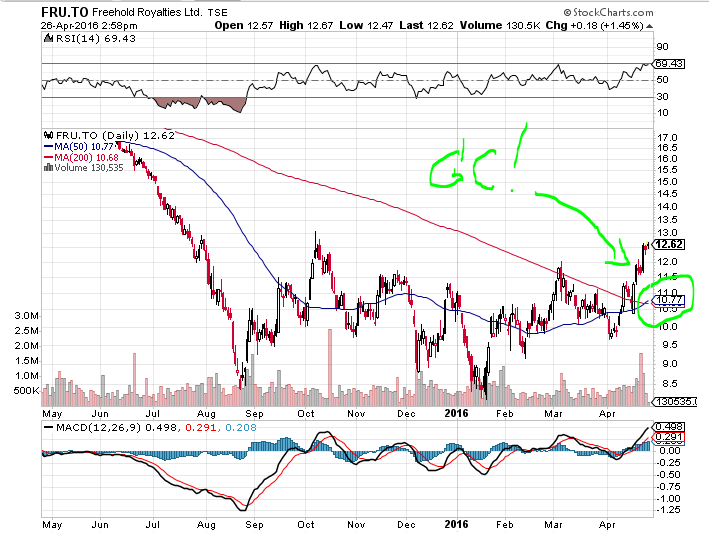 Freehold Royalties Ltd. is a dividend-paying oil and gas company based in Calgary, Alberta. Our royalty interests are a major contributor to our operating and financial performance and are not subject to expenses such as operating and capital costs. Our assets generate income from crude oil, natural gas, natural gas liquids, and potash. Growth is achieved through ongoing development activity on our extensive land base spanning approximately three million gross acres, and through acquisitions. Freehold has no employees. Day-to-day operations are managed by a wholly owned subsidiary of Rife Resources Ltd. To learn more about Rife visit www.rife.com. Freehold's shares are listed for trading on the Toronto Stock Exchange under the trading symbol FRU. Rife is a private exploration and production company, wholly-owned by the CN Pension Trust Funds, the pension fund for employees of the Canadian National Railway Company. Our people have expertise in geology, geophysics, petroleum engineering, land administration, finance, audit and accounting. We have interests in 610,000 gross acres of land in western Canada. Our focus areas are Lloydminster, Deep Basin, and Southeast Saskatchewan. We also manage, through our subsidiary Rife Resources Management Ltd. the operations of Canpar Holdings Ltd. (3.8 million gross acres) and Freehold Royalties Ltd. (3.2 million gross acres). These two companies have a profitable niche of owning oil and gas royalties and mineral titles. Freehold Royalties Ltd.'s board of directors has declared a dividend of four cents per common share to be paid on Oct. 17, 2016, to shareholders of record on Sept. 30, 2016. Freehold Royalties Ltd.'s board of directors has declared a dividend of four cents per common share to be paid on Nov. 15, 2016, to shareholders of record on Oct. 31, 2016. Freehold Royalties Ltd. has released third quarter results for the period ended Sept. 30, 2016.
operations included a $1.1-million loss upon settlement of litigation. (2) A non-generally accepted accounting principle financial measure. (3) Based on the number of shares outstanding at each record date. (4) Note the conversion of natural gas to barrels of oil equivalent (boe). The company had a strong quarter, setting a production record, averaging 12,281 barrels of oil equivalent per day, aided by organic growth within the company's portfolio and a full quarter of production from its recent acquisition, and as a result, the company has revised its 2016 production guidance from 11,700 boe per day to 12,000 boe per day. The company is also seeing activity levels rebound with 48 (2.3 net) wells drilled on its royalty lands over the quarter with higher productivity from new wells. Freehold has established a relatively conservative dividend policy, which the company believes serves shareholders well in times of uncertainty. This quarter's dividend of 12 cents per share was safely within the company's funds from operations of 21 cents per share. The company's long-term goal is to have an adjusted payout ratio between 60 per cent to 80 per cent, and at current levels, the company is comfortably at the bottom of this range. The company expects to use excess free cash flow over and above the company's dividend to finance future acquisitions and pay down debt, keeping the company's net debt to funds from operations between 0.5 to 1.5 times. Looking into 2017, the company remains confident that commodity prices will continue to improve, and the company is looking for indications of oil price stability prior to resetting dividend levels. The company is estimating average production of 11,000 boe per day for 2017 with continued conservatism in forecasting drilling activity. On Nov. 25, 2016, Freehold will celebrate its 20th anniversary. Over this time frame, the company have generated superior returns and would like to thank the company's employees for their hard work, which has made this possible. From a $10-per-share initial public offering in 1996, the company has provided dividends of over $30 per share. It would like to thank its shareholders for their continuing support. The board of directors has declared a dividend of four cents per share, to be paid on Dec. 15, 2016, to shareholders of record on Nov. 30, 2016. The dividend is designated as an eligible dividend for Canadian income tax purposes. Freehold's production averaged a record 12,281 boe per day, a 9-per-cent improvement over third quarter 2015 and a 2-per-cent increase over second quarter 2016. Gains in production were largely driven by better-than-expected third party production additions and a full quarter's production from the company's second quarter 2016 acquisition from certain affiliates of Husky Energy Inc.
Royalty production was up 16 per cent compared with third quarter 2015, averaging 10,169 boe per day, accounting for 83 per cent of production and 93 per cent of operating income. Funds from operations totalled $24.1-million (21 cents per share) in third quarter 2016, flat over the previous quarter but down 13 per cent from last year with reduced commodity prices somewhat offset by higher production. Impacting funds from operations, Freehold settled an outstanding legal claim recognizing a loss of $1.1-million. Freehold generated $9.8-million in free cash flow (1) over and above the company's dividend, which the company applied to outstanding debt. At Sept. 30, 2016, net debt obligations (1) totalled $87.3-million, down $10.9-million from $98.2-million at June 30, 2016. This implies a ratio of net debt to 12-month trailing funds from operations of 1.0 times. Despite challenging commodity prices, the company continues to generate an attractive netback and free cash flow. Cash costs (1) for the quarter totalled $6.78 per boe, down from $7.34 per boe in second quarter 2016 and $8.84 per boe in third quarter 2015. Included in these costs General and Administrative (G&A) costs totalled $1.71 per boe for third quarter2016 versus $2.04 per boe in second quarter 2016 and $2.33 per boe in third quarter 2015. Wells drilled on the company's royalty lands totalled 48 (2.3 equivalent net) in the quarter; for the first three quarters of 2016, 156 (6.1 equivalent net) wells were drilled, including 15 royalty wells on the recently acquired acreage associated with the Husky Transaction, with seven locations targeting the Shaunavon. In third quarter 2016, Freehold issued four leases; 71 leases have been issued year-to-date in 2016, 57 relating to the second quarter 2016 Husky Transaction. Dividends declared for third quarter 2016 totalled $0.12 per share, unchanged from the previous quarter and down from $0.25 per share one year ago. Basic payout ratio(1) (dividends declared/funds from operations) for third quarter 2016 totalled 59 per cent while the adjusted payout ratio(1) (cash dividends plus capital expenditures/funds from operations) for the same period was 55 per cent. The table below summarizes the company's key operating assumptions for 2016, updated to reflect actual statistics for the first nine months and the company's current expectations for the remainder of the year. the DRIP pending further notice. We see average production volumes of 11,000 boe per day (assuming no acquisitions), which includes expectations of 100 boe per day of shut-in working interest natural gas, 100 boe per day of shut-in heavy oil production (primarily working interest) and production additions associated with the company's strong audit function. Estimated volumes are comprised of approximately 56 per cent oil and NGL and 44 per cent natural gas. We continue to maintain the company's royalty focus with royalty production expected to account for approximately 84 per cent of production and 91 per cent of operating income. Recognizing the cyclical nature of the oil and gas industry, the company continue to closely monitor commodity prices and industry trends for signs of changing market conditions. We caution that it is inherently difficult to predict activity levels on the company's royalty lands since the company have no operational control. As well, significant changes (positive or negative) in commodity prices (including Canadian oil price differentials), foreign exchange rates, or production rates may result in adjustments to the dividend rate. Based on the company's current guidance and commodity price assumptions, and assuming no significant changes in the current business environment, the company expect to maintain the monthly dividend rate through the next quarter. We will continue to evaluate the commodity price environment and adjust the dividend levels as necessary (subject to the quarterly review and approval of the company's Board of Directors). Freehold's 2016 third quarter interim unaudited condensed consolidated financial statements and accompanying Management's Discussion and Analysis (MD&A) are being filed today with Canadian securities regulators and will be available at www.sedar.com and on the company's website. Freehold Royalties Ltd.'s board of directors has declared a dividend of four cents per common share to be paid on Jan. 16, 2017, to shareholders of record on Dec. 31, 2016. Freehold Royalties Ltd.'s board of directors has declared a dividend of four cents per common share to be paid on March 15, 2017, to shareholders of record on Feb. 28, 2017. Freehold's primary focus is on acquiring and managing oil and gas royalties. The majority of production comes from royalty interests (mineral title and gross overriding royalties). Freehold Royalties Ltd. has released its fourth-quarter and year-end results for the period ended Dec. 31, 2016. (2)Based on the number of shares outstanding at each record date. (3)See Conversion of Natural Gas to Barrels of Oil Equivalent (boe). We see positive momentum entering 2017, with Freehold continuing to achieve production growth from its attractive property portfolio. Record production and robust drilling activity have led us to increase our 2017 production guidance and raise our dividend by 25%. Freehold achieved record production again this quarter, marking the 12th consecutive quarterly increase and the second consecutive quarter without an acquisition. Organic growth primarily came from development in Saskatchewan and in central Alberta. Looking forward, we are comfortable that commodity prices have found support at current levels, which is driving higher levels of drilling activity. Based on increased drilling through the fourth quarter, better than expected production through year-end and our recent acquisition in February (see Subsequent Event), we are revising our 2017 production forecast from 11,000 boe/d to a range of 11,300 boe/d to 11,800 boe/d. We are increasing our monthly dividend from $0.04 to $0.05 per share consistent with our strategy of a 60%-80% adjusted payout ratio. Our projected adjusted payout ratio for 2017 is 65%, safely at the lower end of our payout target range. Freehold provides a low risk investment opportunity in the oil and gas industry. The Board of Directors has declared a dividend of Cdn. $0.05 per share to be paid on April 17, 2017 to shareholders of record on March 31, 2017. The dividend is designated as an eligible dividend for Canadian income tax purposes. In keeping with our strategy of making accretive acquisitions that complement our existing portfolio, in February 2017 Freehold closed a $34 million acquisition of various gross overriding royalties and mineral title lands in the greater Dodsland area of Saskatchewan. There were 32,000 acres of royalty land acquired with current estimated production of 185 boe/d (91% oil). The transaction strengthens our position in the Dodsland Viking play, with development expected to remain strong at current commodity price levels. Freehold's production averaged a record 12,579 boe/d, a 6% improvement over Q4-2015 and 2% increase over Q3-2016. Gains in production were largely driven by volumes associated with our Q2-2016 acquisition, better than expected third party production additions and the strength of our audit function (over 400 boe/d of prior period adjustments in the quarter, which includes compensatory royalties on our mineral title lands). Royalty production was up 12% compared to Q4-2015 averaging 10,351 boe/d and accounted for 93% of operating income and 82% of production. Q4-2016 royalty and other revenue was up 18% to $39.9 million versus $33.8 million in the previous year due to increased production and higher average price realizations. Funds from operations totaled $30.4 million, an increase of 19% due to higher volumes and commodity prices. On a per share basis, funds from operations were $0.26/share in Q4-2016, up from $0.21/share in Q3-2016. Net income was $1.6 million compared to a $7.4 million loss in Q4-2015, which resulted from an $8.0 million impairment charge. Freehold generated $14.1 million in free cash flow (1), over and above our dividend, which we applied to outstanding debt. As a result, at December 31, 2016, net debt totaled $73.2 million, down from $87.3 million at September 30, 2016, implying a net debt to 12-month trailing funds from operations ratio of 0.8 times. Cash costs (1) for the quarter totaled $7.83/boe, up slightly from $7.63/boe in Q4-2015, as we saw operating costs add approximately $0.7 million ($0.60/boe) for charges relating to prior periods. Wells drilled on our royalty lands totaled 125 (7.8 net) in the quarter, up from 48 (2.3 net) in the previous quarter. In Q4-2016, Freehold issued 9 leases; 93 leases were issued in 2016, 63 relating to the Q2-2016 acquisition. Dividends declared for Q4-2016 totaled $0.12 per share, unchanged from the previous quarter and down from $0.21 per share one year ago. Basic payout ratio (1) (dividends declared/funds from operations) for Q4-2016 totaled 46% while the adjusted payout ratio (1) ((cash dividends plus capital expenditures)/funds from operations) for the same period was 53%. Including drilling associated with acquisitions, 281 (13.9 net) wells were drilled on our royalty lands in 2016, a 25% decrease versus 2015. The fourth quarter saw a resurgence in activity on our land with 125 gross (7.8 net) locations drilled, representing over 50% of our net annual total. Activity through the quarter was focused in the greater Dodsland area with the new operator accelerating activity and drilling 16 new locations. In southeast Saskatchewan we also saw traditional players increase activity with 25 wells drilled. In addition, incremental drilling also targeted prospects in the Alberta Viking, the Cardium and in heavy oil. On the acquired lands in 2016, 56 locations were drilled, materially higher than our initial forecast for the year. Of these wells 37 were drilled in the fourth quarter, mostly in southwest Saskatchewan, in Alberta Viking and in the Deep Basin. Achieved record production with volumes averaging 12,219 boe/d, representing a 12% increase versus the same period last year. Volumes were comprised of 58% oil and liquids and 42% natural gas. On the royalty side volumes averaged 9,936 boe/d, representing a 20% increase versus 2015. Funds from operations totaled $94.2 million or $0.85/share. This was down from $103.8 million or $1.15/share in 2015 reflecting continued weakness in commodity prices. Declared dividends were $59.5 million ($0.54/share), down from $90.1 million ($1.00/share) in 2015, reflecting lower funds from operations and a conservative payout strategy. Ended 2016 with net debt of $73.2 million, implying net debt to funds from operations of 0.8 times. At year end we had nearly $180 million in available room within our credit facility. Executed a major transaction, acquiring a $162 million royalty package; further diversifying our land base by adding approximately 2.5 million acres of royalty land, increasing our total royalty lands to approximately 5.9 million acres. Proved plus probable reserves totalled 38.3 mmboe, up from 36.1 mmboe in 2015. We have increased our production guidance from 11,000 boe/d to a range of 11,300 boe/d to 11,800 boe/d, due to production additions on our royalty lands along with recently added acquisition volumes. Volumes are expected to be weighted approximately 55% oil and natural gas liquids (NGL) and 45% natural gas. We continue to maintain our royalty focus with royalty production accounting for 84% of forecasted 2017 production and 91% of operating income. We have increased our West Texas Intermediate (WTI) and Western Canadian Select (WCS) price assumptions from US$50.00/bbl and $46.00/bbl to US$52.00/bbl and $49.00/bbl respectively. We have revised downward our 2017 AECO natural gas price assumption from $3.00/mcf to $2.60/mcf. We have revised our G&A expense assumption from $2.65/boe to $2.60/boe reflecting the increased production guidance. After increasing our dividend by 25% from $0.04 to $0.05 per month, we expect our 2017 adjusted payout ratio ((cash dividends plus capital expenditures)/funds from operations) to be approximately 65%. We forecast year-end net debt to funds from operations of approximately 0.6 times based on our revised key operating assumptions. Based on our current guidance and commodity price assumptions, and assuming no significant changes in the current business environment, we expect to maintain the monthly dividend rate through the next quarter. We will continue to evaluate the commodity price environment and adjust the dividend levels as necessary (subject to the quarterly review and approval of our Board of Directors). A conference call to discuss financial and operational results for the period ended December 31, 2016 will be held for the investment community on Friday, March 3, 2017 beginning at 6:00 am MT (8:00 am ET). To participate in the conference call, approximately 10 minutes prior to the conference call, please dial 1-800-273-9672 (toll-free in North America). Freehold's 2016 audited financial statements and accompanying Management's Discussion and Analysis (MD&A) and Annual Information Form (AIF) are being filed today with Canadian securities regulators and will be available at www.sedar.com and on our website. Freehold Royalties Ltd.'s board of directors has declared a dividend of five cents per common share to be paid on May 15, 2017, to shareholders of record on April 30, 2017. Freehold Royalties Ltd. has released first quarter results for the period ended March 31, 2017. Freehold Royalties Ltd.'s board of directors has declared a dividend of five cents per common share to be paid on July 17, 2017, to shareholders of record on June 30, 2017. Freehold Royalties Ltd. has released second quarter results for the period ended June 30, 2017. (1) A non-generally accepted accounting principle financial measure. (3) Based on the conversion of natural gas to barrels of oil equivalent. Freehold achieved record royalty production and solid cash flow results in second quarter 2017, marking the fourth consecutive quarter of increasing royalty production on a per-share basis. We are revising our 2017 production guidance up 500 barrels of oil equivalent per day to 11,800 to 12,300 boe per day with better-than-expected audit recoveries and operating results. At current dividend levels, we are forecasting an adjusted payout ratio for 2017 of 61 per cent, safely within our target adjusted payout range of 60 per cent to 80 per cent. Not only are we growing royalty production on a per-share basis, we exited the quarter with lower debt resulting in net debt to 12-month trailing funds from operations of 0.4 time (net debt of $50-million). In second quarter 2017, Freehold issued 12 new lease agreements for a cumulative total of 37 new leases in the first half of 2017, exceeding the entire 2016 new lease count as we deliver continued organic growth. Our quarter was in line with Freehold's objective to deliver growth and low-risk attractive returns to shareholders over the long term. The board of directors has declared a dividend of five cents per share to be paid on Sept. 15, 2017, to shareholders of record on Aug. 31, 2017. The dividend is designated as an eligible dividend for Canadian income tax purposes. The attached guidance update table summarizes the company's key operating assumptions for 2017. The company is increasing its 2017 production range to 11,800 to 12,300 boe per day (previously 11,300 to 11,800 boe per day), as a result of higher-than-expected results through the first half of the year, mostly due to drilling activity and prior-period adjustments. The company does not include the effects of future acquisition activity in its forecasts. Also, minimal prior-period adjustments are in its forecast as the company does not record the effects of audit and compliance activities until revenue collection is certain. Volumes are expected to be weighted approximately 55 per cent oil and natural gas liquids (NGL) and 45 per cent natural gas. The company continues to improve its royalty focus with royalty production accounting for 88 per cent of forecasted 2017 production (up from 87 per cent) and 95 per cent of operating income (up from 94 per cent). The company is reducing its West Texas Intermediate price assumption to $50 (U.S.) per barrel (previously $52 (U.S.) per bbl). Western Canadian Select remains unchanged due to positive effects of the declining light/heavy oil differentials. Its AECO natural gas price assumption remains at $2.60 per thousand cubic feet. The Canadian-dollar/U.S.-dollar exchange rate has been adjusted upward to 77 cents from 76 cents as a result of recent Canadian-dollar appreciation and market expectations for the rest of the year. Its operating costs forecast is revised downward to $2.40 per boe (from $2.50 per boe) and general and administrative costs to $2.50 per boe (from $2.60 per boe) as a result of the company's increased royalty production. Based on its current five-cent monthly dividend level, the company expects its 2017 adjusted payout ratio ((cash dividends plus capital expenditures)/funds from operations) to be approximately 61 per cent. The company continues to forecast year-end net debt to funds from operations of approximately 0.3 time based on its revised key operating assumptions. Recognizing the cyclical nature of the oil and gas industry, the company continues to closely monitor commodity prices and industry trends for signs of deteriorating market conditions. It cautions that it is inherently difficult to predict activity levels on its royalty lands since it has no operational control. As well, significant changes (positive or negative) in commodity prices (including Canadian oil price differentials), foreign exchange rates or production rates may result in adjustments to the dividend rate. Based on the company's current guidance and commodity price assumptions, and assuming no significant changes in the current business environment, the company expects to maintain the current monthly dividend rate through the next quarter. It will continue to evaluate the commodity price environment and adjust the dividend levels as necessary (subject to the quarterly review and approval of its board of directors). A conference call to discuss financial and operational result for the period ended June 30, 2017, will be held for the investment community on Aug. 10, 2017, beginning at 6 a.m. MT (8 a.m. ET). To participate in the conference call, approximately 10 minutes prior to the conference call, please dial 1-800-273-9672 (toll-free in North America). Freehold's second quarter 2017 interim unaudited condensed consolidated financial statements and accompanying management's discussion and analysis are being filed today with Canadian securities regulators and will be available at SEDAR and on the company's website. Freehold Royalties Ltd. has released its third quarter results for the period ended Sept. 30, 2017. (1) Non-GAAP (generally accepted accounting principles) financial measures. "As a result of strong drilling and production performance, we are increasing our 2017 average production guidance to 12,000 to 12,500 boe/d. In the quarter, we created 30 new leases with producers, with year-to-date leasing more than double when compared to all of 2016. 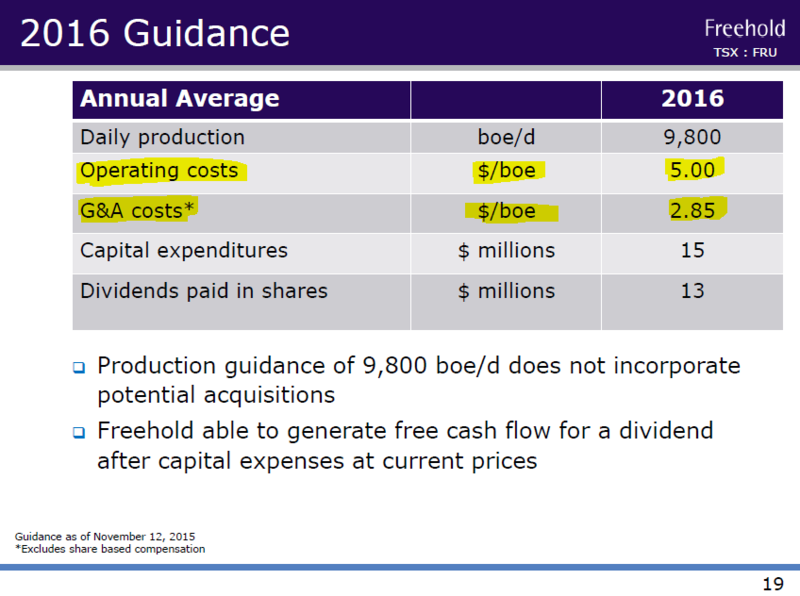 Freehold continued to pay down debt, maintained a conservative payout ratio and drove cash costs below $5/boe, in line with providing a safe oil and gas investment. Over all, our objective is to deliver growth and low-risk attractive returns to our shareholders over the long term, and we feel the results of this quarter are consistent with this goal." The board of directors has declared a dividend of five Canadian cents per share to be paid on Dec. 15, 2017, to shareholders of record on Nov. 30, 2017. The dividend is designated as an eligible dividend for Canadian income tax purposes. Freehold's production averaged 12,036 barrels of oil equivalent per day (boe/d), down 2 per cent versus Q3 2016. The reduction in volumes was primarily the result of working interest dispositions made in 2017 (approximately 750 boe/d for the full-year 2016) as the company's royalty volumes displayed strong growth versus the same period in 2016. Royalty production was up 7 per cent compared with Q3 2016, averaging 10,919 boe/d. Gains in volumes were associated with strength in the company's audit function (approximately 700 boe/d in prior-period adjustments) and strong drilling on its lands. Royalty interests accounted for 91 per cent of total production and contributed 99 per cent of operating income in Q3 2017, both representing the highest totals in the company's history. Freehold remain committed to enhancing its royalty focus with continuing efforts to dispose of its non-core working interest production. Freehold sold a minor working interest property for $3.0-million. Production associated with this asset was approximately 45 boe/d. Wells drilled on Freehold's royalty lands totalled 144 (6.4 net) in Q3 2017, up from 48 (2.3 net) in Q3 2016. From Jan. 1, 2017, to Sept. 30, 2017, Freehold has seen 352 (16.6 net) wells drilled on its royalty lands compared with 156 (6.1 net) locations drilled during the same period in 2016. In Q3 2017, Freehold issued 30 new leases for a cumulative total of 69 new leases in the first nine months of 2017, significantly exceeding the 2016 total new lease count. It expects to see drilling associated with these efforts to occur over the remainder of the year and into 2018. Freehold's unleased holdings are available for review on its website's leasing opportunities page. Funds from operations totalled $27.9-million, an increase of 16 per cent compared with Q3 2016, largely due to an increase in revenue and reduced operating costs. On a per-share basis, funds from operations were 24 cents per share in Q3 2017 up from 21 cents per share in Q3 2016. Freehold generated $8.6-million in free cash flow (1), over and above its dividend, which the company applied to outstanding debt. At Sept. 30, 2017, net debt totalled $38.3-million, resulting in a ratio of net debt to 12-month trailing funds from operations of 0.3 times. Even though the company is below its target of 0.5 to 1.5 times net debt to funds from operations, it will continue to apply excess cash to debt repayment in the short term but also remain committed to acquiring additional royalties. Cash costs (1) for the quarter totalled $4.80/boe, down from $6.78/boe in Q3 2016 and $5.63/boe in Q2 2017. The reduction versus the same period last year reflects the disposition of working interest production and deleveraging of Freehold's balance sheet. Dividends declared for Q3 2017 totalled 15 cents per share, up 25 per cent from 12 cents per share one year ago. In March, 2017, Freehold announced an increase to its monthly dividend from four cents to five cents per share. Basic payout ratio (1) (dividends declared/funds from operations) for Q3 2017 totalled 63 per cent while the adjusted payout ratio (1) ((cash dividends plus capital expenditures)/funds from operations) for the same period was 69 per cent. (1) These are non-GAAP financial measures. Including drilling associated with acquisitions, 352 (16.6 net) wells were drilled on Freehold's royalty lands during the first nine months of 2017, a 172-per-cent increase versus the same time period in 2016 (on a net basis). After some slowdown in activity during the previous quarter, Q3 2017 saw a resurgence in activity on Freehold's lands with 144 (6.4 net) locations drilled, compared with 48 (2.3 net) during the same period last year. Activity through the first nine months of 2017 was primarily focused on oil prospects including the Viking at Redwater and Dodsland, which represented greater than 40 per cent of Freehold's net locations through the first three quarters. Through this time period, activity has also been concentrated in southeast Saskatchewan (Bakken, Mississippian), southwest Saskatchewan (Shaunavon) and the Deep basin (Montney). In Q3 2017, Freehold has also seen renewed activity in central Alberta (Cardium) as well as eastern Alberta (Mannville heavy oil). Freehold's top payors continue to represent some of the most well-capitalized E&P (exploration and production) companies in Canada. period (this may differ from the closing date of the acquisitions). gross well by Freehold's royalty interest percentage. interests in hundreds of wells. Below are details of some of the changes made to Freehold's key operating assumptions for 2017. The company is increasing its 2017 average production range to 12,000 to 12,500 boe/d (previously 11,800 to 12,300 boe/d). Freehold does not include the effects of future acquisition activity in its forecasts. Also, minimal prior-period adjustments are in the company's forecast as Freehold does not record the effects of audit and compliance activities until revenue collection is certain. Freehold continues to improve its royalty focus with royalty production accounting for 89 per cent of forecasted 2017 production (up from 88 per cent) and 96 per cent of operating income (up from 95 per cent). Freehold's AECO natural gas price assumption has been reduced to $2.40 per thousand cubic feet (previously $2.60 per thousand cubic feet). Based on its current five-cent monthly dividend level, Freehold expects its 2017 adjusted payout ratio ((cash dividends plus capital expenditures)/funds from operations) to be approximately 62 per cent (previously 61 per cent). The company continues to forecast year-end net debt to funds from operations of approximately 0.3 times based on its revised key operating assumptions. Reflecting the expectation that most of Freehold's royalty payors will provide capital spending guidance late in 2017 or early 2018, the company expects to provide its 2018 operating guidance as part of its Q4 2017 results in March, 2018. Recognizing the cyclical nature of the oil and gas industry, Freehold continues to closely monitor commodity prices and industry trends for signs of deteriorating market conditions. The company caution that it is inherently difficult to predict activity levels on its royalty lands since it has no operational control. As well, significant changes (positive or negative) in commodity prices (including Canadian oil price differentials), foreign exchange rates or production rates may result in adjustments to the dividend rate. Based on the company's current guidance and commodity price assumptions, and assuming no significant changes in the current business environment, Freehold expects to maintain the current monthly dividend rate through the next quarter. It will continue to evaluate the commodity price environment and adjust the dividend levels as necessary (subject to the quarterly review and approval of its board of directors). A conference call to discuss financial and operational results for the period ended Sept. 30, 2017, will be held for the investment community on Friday, Nov. 10, 2017, beginning at 6 a.m. MT (8 a.m. ET). To participate in the conference call, approximately 10 minutes prior to the conference call, please dial 1-800-806-5484 (toll-free in North America). Freehold's 2017 third quarter interim unaudited condensed consolidated financial statements and accompanying management's discussion and analysis (MD&A) are being filed today with Canadian securities regulators and will be available on SEDAR and on the company's website. Consistent with the company's strategy of enhancing the quality of our underlying asset base, Freehold Royalties Ltd. has closed the acquisition of a long-life, light oil gross overriding royalty (GORR). Freehold is acquiring a new 2-per-cent GORR in petroleum and natural gas rights in the Cardium in 173,440 gross (120,960 net) acres of land in the greater Pembina area. The purchase price of the GORR is $52-million plus the assignment by Freehold of minor working interest assets, and the royalty is forecast to generate approximately $3.6-million in operating income (based on strip pricing) and approximately 210 barrels of oil equivalent per day (74 per cent light oil) in 2018. The GORR is to be paid by an exploration and production producer with multiple years of drilling inventory. The acquisition was financed through its existing credit line. As a result of the acquisition, Freehold's pro forma 2017 year-end net debt to funds from operations is expected to be 0.7 times, with approximately $90-million available on the company's existing facility. The company sees the transaction as enhancing the sustainability of Freehold's dividend, increasing the number of drilling locations on its royalty lands and adding to the quality of its asset base. Freehold will give 2018 guidance as part of the company's Q4 2017 results, which will be released after market close on March 8, 2018. Freehold Royalties Ltd. has released its fourth quarter and year-end results for the period ended Dec. 31, 2017. (1) See non-GAAP (generally accepted financial measures). (2) Based on the number of shares outstanding at each record date. (3) See conversion of natural gas to barrels of oil equivalent (boe). "Two thousand seventeen was a successful year for Freehold, as we achieved a number of objectives both operationally and financially. "Operationally, Freehold achieved record production in 2017 as volumes averaged 12,350 barrels of oil equivalent per day (boe/d). We grew royalty production by 10 per cent with volumes averaging 10,963 boe/d, a testament to the quality of our royalty portfolio. Volume additions were associated with oil-focused drilling on our royalty lands and a key Viking acquisition. We also completed a transaction late in the year, increasing our position in the Cardium. These deals provide multiyears of drilling inventory. "Financially, we are increasing our monthly dividend from five cents to 5.25 cents per share (5-per-cent increase). This is consistent with our dividend strategy of positioning our adjusted payout at 60 per cent to 80 per cent of funds from operations. Our forecasted adjusted payout ratio for 2018 is 61 per cent, safely at the lower end of our target range. We lowered our net debt and lowered our total cash costs to $5.13 per boe in the fourth quarter. Our goal is to position Freehold as a low-risk, attractive investment in oil and gas which we continue to achieve." With increasing oil prices and strength in operations, Freehold's board of directors has approved a 5-per-cent increase to its monthly dividend to 5.25 cents per share or 63 cents per share annualized. The board has declared a dividend of 5.25 cents per common share to be paid on April 16, 2018, to shareholders of record on March 31, 2018. The dividend is designated as an eligible dividend for Canadian income tax purposes. The dividend increase is in line with Freehold's previously stated dividend policy which outlines a 60-per-cent-to-80-per-cent adjusted payout ratio based on forward-looking funds from operations. Based on the company's current guidance and commodity price assumptions, and assuming no significant changes in the current business environment, Freehold expects to maintain the revised monthly dividend rate through the next quarter. Freehold will continue to evaluate the commodity price environment and adjust the dividend levels as necessary (subject to the quarterly review and approval of Freehold's board). Consistent with Freehold's strategy of enhancing its royalty focus, on Feb. 14, 2018, Freehold disposed of its non-core working interest in the Pembina Cardium unit No. 9 in Alberta for $8-million (before adjustments). As part of the transaction, Freehold retained a 4-per-cent gross overriding royalty (GORR) on the same interests that were sold. Average production and operating income associated with the asset in 2017 were 179 boe/d and $2.1-million (before GORR), respectively. This deal reduced Freehold's decommissioning liability by approximately 40 net working interest wells and also reduced its exposure to capital activities as Freehold had $2.4-million of capital expenditures related to the property in 2017. On Feb. 28, 2018, Freehold completed a $7.0-million royalty acquisition in the prospective East Shale Duvernay basin in central Alberta. As part of the transaction, Freehold acquired a 1.0-per-cent GORR on approximately 113,920 gross acres (178 sections) and a 3.0-per-cent GORR on 1,920 gross acres (three sections) of royalty lands. The asset has multiple years of development planned. On March 7, 2018, Freehold closed two royalty acquisitions, one of them on the Weyburn unit in Saskatchewan and the other on the Mitsue Gilwood sand unit No. 1 in Alberta. At Weyburn, where Freehold acquired a 0.2-per-cent lessor royalty, Freehold sees multiyear upside through expansion of the existing CO2 (carbon dioxide) enhanced oil recovery process and additional infill drilling. At Mitsue, where Freehold acquired a 1.9-per-cent new GORR interest, the company sees further value enhancing opportunities through waterflood optimization, reactivations and infill drilling. The purchase price associated with these transactions was $24-million (before adjustments) and the assignment by Freehold of certain minor working interest assets. Current production associated with the acquired royalty interests is approximately 110 boe/d (100 per cent oil) and $2.6-million in annualized operating income assuming strip pricing. Freehold sees these transactions shallowing its already-low corporate decline. Both transactions were financed through Freehold's existing credit facilities. Freehold's production averaged 12,032 boe/d, down 4 per cent versus the same period in 2016. Reduced volumes were largely driven by non-core working interest dispositions (approximately 800 boe/d based on 2016) completed in 2017. Royalty production was up 6 per cent compared with Q4 2016 averaging 10,960 boe/d. Increased volumes were largely associated with better-than-expected third party production additions and the strength in Freehold's audit function (over 600 boe/d of prior-period adjustments in the quarter). Royalties, as a percentage of operating income (97 per cent) and production (91 per cent), highlight the company's commitment to its royalty focus. Q4 2017 royalty and other revenue was down 4 per cent to $38.4-million versus the previous year largely due to reduced working interest production volumes. Net loss was $8.1-million compared with $1.6-million net income in Q4 2016. The loss was a result of a $16.2-million impairment charge on Freehold's working interest assets, approximately half from assets disposed of in Q4 2017 and subsequent to year-end. Funds from operations for Q4 2017 totalled $32.0-million, an increase of 5 per cent versus the same period in 2016. The increase year over year reflected growth in royalty revenue and lower cash costs. On a per-share basis, funds from operations totalled 27 cents per share in Q4 2017, up from 26 cents per share in Q4 2016. Freehold closed the acquisition of a new 2-per-cent GORR in petroleum and natural gas rights in the Cardium, which included 166,000 gross acres (259 sections) of land in the greater Pembina area of Alberta. The purchase price of the GORR was $52-million plus the assignment by Freehold of certain minor working interest assets. The royalty assets are currently producing approximately 210 boe/d (74 per cent light oil). Freehold generated $12.9-million in free cash flow (1), over and above its dividend in Q4 2017, which the company applied to outstanding debt. At Dec. 31, 2017, net debt totalled $68.6-million, up from $38.3-million at Sept. 30, 2017, implying a net-debt-to-12-month-trailing-funds-from-operations ratio of 0.6 times. The increase in net debt quarter over quarter reflected the $52-million royalty acquisition which was financed through its existing credit facility. Cash costs (1) for the quarter totalled $5.13 per boe, down from $7.83 per boe in Q4 2016. The decrease versus Q4 2016 reflected lower operating expenses due to the continued disposition of Freehold's working interest portfolio and gains in royalty production. Wells drilled on Freehold's royalty lands totalled 112 (5.7 net) in the quarter, down from 144 (6.4 net) in the previous quarter. In Q4 2017, Freehold issued 32 leases associated with its unleased mineral title lands; 100 leases were issued in 2017, compared with 30 leases in all of 2016. Dividends declared for Q4 2017 totalled 15 cents per share, unchanged from the previous quarter and up from 12 cents per share one year ago. Basic payout ratio (1) (dividends declared divided by funds from operations) for Q4 2017 totalled 55 per cent while the adjusted payout ratio (1) ((cash dividends plus capital expenditures) divided by funds from operations) for the same period was 60 per cent. Including drilling associated with acquisitions, 464 (22.3 net) wells were drilled on Freehold's royalty lands in 2017, a 65-per-cent increase versus 2016. The majority of the spending on its royalty lands continues to be focused on oil targets with approximately 60 per cent of the drilling associated with prospects in southeast Saskatchewan and in the Viking formation. In addition, Freehold has seen an uptick in activity associated with the Shaunavon in southwest Saskatchewan and liquids-rich natural gas targets in the Deep basin in Alberta. Based on these activity levels, the company estimates $760-million was spent on its royalty lands in 2017. This compared with its estimate of $475-million in 2016. Looking into 2018, Freehold remains optimistic that activity levels will remain strong on its royalty lands. Proved plus probable reserves totalled 35.3 million boe, down from 38.3 million boe in 2016, with working interest dispositions in 2017 contributing to this reduction of reserves. The associated table summarizes Freehold's key operating assumptions for 2018. Freehold is assuming a production range of 11,750 boe/d to 12,250 boe/d. Volumes are expected to be weighted approximately 55 per cent oil and natural gas liquids (NGL), and 45 per cent natural gas. Freehold continues to maintain its royalty focus with royalty production accounting for 93 per cent of forecasted 2018 production and 99 per cent of operating income. Freehold is currently forecasting 25 net wells will be drilled on its lands in 2018, representing a 12-per-cent increase over near-record drilling on its lands in 2017. Freehold is assuming WTI (West Texas Intermediate) and WCS (Western Canadian Select) price assumptions of $60 (U.S.) per barrel and $45 per barrel, respectively, and AECO at $2 per thousand cubic feet (mcf). Freehold's general and administrative expense assumption is forecast at $2.50 per boe. Total cash costs are forecast to be approximately $5 per boe. After increasing its monthly dividend by 5 per cent from five cents to 5.25 cents per share, the company expects its 2018 adjusted payout ratio ((cash dividends plus capital expenditures) divided by funds from operations) to be approximately 61 per cent. We forecast year-end net debt to funds from operations of approximately 0.4 times based on our revised key operating assumptions. Recognizing the cyclical nature of the oil and gas industry, Freehold continues to closely monitor commodity prices and industry trends for signs of changing market conditions. The company cautions that it is inherently difficult to predict activity levels on its royalty lands since it has no operational control. As well, significant changes (positive or negative) in commodity prices (including Canadian oil price differentials), foreign exchange rates or production rates may result in adjustments to the dividend rate. Freehold's reserves information is included in the company's annual information form (AIF), which is available on SEDAR and Freehold's website. A conference call to discuss financial and operational results for the period ended Dec. 31, 2017, will be held for the investment community on Friday, March 9, 2018, beginning at 7 a.m. MT (9 a.m. ET). To participate in the conference call, approximately 10 minutes prior to the conference call, please dial 1-800-806-5484 (toll-free in North America). Freehold's 2017 audited financial statements, and accompanying management's discussion and analysis (MD&A) and annual information form (AIF), are being filed today with Canadian securities regulators and will be available on SEDAR and on the company's website. To provide a single unit of production for analytical purposes, natural gas production and reserves volumes are converted mathematically to equivalent barrels of oil. Freehold uses the industry-accepted standard conversion of 6,000 cubic feet of natural gas to one barrel of oil. The 6:1 ratio is based on an energy equivalency conversion method primarily applicable at the burner tip. It does not represent a value equivalency at the wellhead and is not based on either energy content or current prices. While the boe ratio is useful for comparative measures and observing trends, it does not accurately reflect individual product values and might be misleading, particularly if used in isolation. As well, given that the value ratio, based on the current price of crude oil to natural gas, is significantly different from the 6:1 energy equivalency ratio, using a 6:1 conversion ratio may be misleading as an indication of value. Within this news release, references are made to terms commonly used as key performance indicators in the oil and natural gas industry. The company believes that, operating income, operating netback, basic payout ratio, adjusted payout ratio, free cash flow and cash costs are useful supplemental measures for management and investors to analyze operating performance, financial leverage and liquidity, and Freehold uses these terms to facilitate the understanding and comparability of its results of operations and financial position. However, these terms do not have any standardized meanings prescribed GAAP and therefore may not be comparable with the calculations of similar measures for other entities. Operating income, which is calculated as royalty and other revenue less royalties and operating expenses, represents the cash margin for product sold. Operating netback, which is calculated as average unit sales price less royalties and operating expenses, represents the cash margin for product sold, calculated on a per-barrel-of-oil-equivalent basis. Payout ratios are often used for dividend-paying companies in the oil and gas industry to identify their dividend levels in relation to the funds they receive and use in their capital and operational activities. Basic payout ratio is calculated as dividends declared as a percentage of funds from operations. Adjusted payout ratio is calculated as dividends paid in cash plus capital expenditures as a percentage of funds from operations. Free cash flow is calculated by subtracting capital expenditures from funds from operations. Free cash flow is a measure often used by dividend-paying companies to determine cash available for payment of dividends, paying down debt or investment. The cash cost measure is a total of certain cash expenses in the statement of income (loss) deducted in determining funds from operations. For Freehold, the measure is identified as royalty expense, operating expense, general and administrative expense, interest expense, and share-based compensation payments. It is key to funds from operations, representing the ability to sustain dividends, repay debt and finance capital expenditures. Freehold refers to various per-barrel-of-oil-equivalent figures which provide meaningful information on its operational performance. The company derives per-barrel-of-oil-equivalent figures by dividing the relevant revenue or cost figure by the total volume of oil, NGL and natural gas production during the period, with natural gas converted to equivalent barrels of oil as described above. Freehold Royalties Ltd. has released its first quarter results for the period ended March 31, 2018. Freehold continued to generate strong returns for our shareholders in Q1-2018 as royalty production averaged 11,197 boe/d, up 5% over the same period in 2017. We expect near record drilling on our lands and are maintaining our 2018 production forecast between 11,750-12,250 boe/d. After increasing our dividend by 5% earlier this year, we are forecasting an adjusted payout ratio for 2018 near the lower end of our target adjusted payout range of 60%-80%. We will continue to monitor commodity prices and allocate free cash flow in ways that maximize shareholder value. We recently held our inaugural Investor Day unveiling our 2017 Asset Book highlighting the multi-year upside on Freehold's royalty lands. A copy can be found on our website at www.freeholdroyalties.com. As a leading royalty company, Freehold's objective is to deliver growth and low risk attractive returns to shareholders over the long term which we have continued to provide in this reporting period. The Board has declared a dividend of $0.0525 per common share to be paid on June 15, 2018 to shareholders of record on May 31, 2018. The dividend is designated as an eligible dividend for Canadian income tax purposes. -- Freehold's royalty production averaged 11,197 boe/d, up 5% versus Q1-2017 and 2% when compared to Q4-2017. Growth in production was associated with acquisitions completed late in 2017 and during Q1-2018, the strength of our audit function (approximately 550 boe/d of prior period adjustments) and third party drilling on our lands. -- Royalty interests accounted for 93% of total production and contributed 99% of operating income in Q1-2018, reinforcing our royalty focus. -- Funds from operations totaled $32.4 million, an increase of 1% compared to Q1-2017, with slightly lower revenue more than offset by a reduction in cash costs. On a per share basis, funds from operations was $0.27/share in Q1-2018 flat to $0.27/share in Q1-2017. -- While West Texas Intermediate (WTI) prices improved 21% versus the same period in 2017, Edmonton Light Sweet oil prices were up only 12% and Western Canadian Select (WCS) prices were down 1% over the same period, reflecting the infrastructure/egress issues Canadian producers continue to experience. In addition, AECO prices retreated 37% versus the same quarter in 2017, and the Canadian/U.S. exchange rate increased, resulting in average oil and gas price realizations on a $/boe basis similar to Q1-2017. -- ?Freehold generated $12.8 million in free cash flow (1), over and above our dividend, which we applied to outstanding debt. At March 31, 2018, net debt totaled $89.6 million resulting in a net debt to 12-month trailing funds from operations ratio of 0.7 times. Freehold closed a $7.0 million royalty acquisition in the prospective East Shale Duvernay Basin in central Alberta. As part of the transaction, Freehold acquired a 1.0% Gross Overriding Royalty (GORR) on approximately 114,000 gross acres and a 3.0% GORR on 1,920 gross acres of royalty lands. The asset has multiple years of development planned. Freehold closed two other royalty acquisitions, one in the Weyburn Unit in Saskatchewan and the other on the Mitsue Gilwood Sand Unit #1 in Alberta. The purchase price associated with these transactions was $24 million and the assignment by Freehold of certain minor working interest assets. Freehold disposed of our non-core working interest in the Pembina Cardium Unit No. 9 in Alberta for $8.1 million. As part of the transaction Freehold retained a new 4.0% GORR on the same interests that were sold. Wells drilled on our royalty lands totaled 239 (6.4 net) in the quarter compared to 150 (8.6 net) in Q1-2017 and 112 (5.7 net) in the previous quarter. In Q1-2018, Freehold issued 42 new lease agreements with 15 companies, compared to 32 issued in Q4-2017 and 25 leases in Q1-2017, highlighting the success of our leasing team. Cash costs (1) for the quarter totaled $6.32/boe, down from $7.66/boe in Q1-2017. Cash costs are typically higher in the first quarter of the year associated with certain annual general and administrative charges that occur early in the year. For 2018, we are forecasting cash costs of approximately $5.00/boe. Dividends declared for Q1-2018 totaled $0.1525 per share, up slightly versus the previous year. In March 2018, Freehold announced an increase to its monthly dividend from $0.05 to $0.0525 per share. Basic payout ratio (1) (dividends declared/funds from operations) for Q1-2018 totaled 56% while the adjusted payout ratio (1) ((cash dividends plus capital expenditures)/funds from operations) for the same period was 60%. Including drilling associated with acquisitions, 239 (6.4 net) wells were drilled on our royalty lands during the first three months of 2018, up 59% on a gross measure but down 26% on a net measure versus the same period in 2017. When compared to Q4-2017 activity increased 113% and 12% on a gross and net measure respectively. Activity through the first three months of 2018 was primarily focused on Saskatchewan oil prospects, including Viking at Dodsland, Mississippian plays in SE Saskatchewan, and Shaunavon in SW Saskatchewan. Together, Saskatchewan and Manitoba wells represented greater than 60% of our gross non-unit drilling through the quarter. Alberta activity has been concentrated in the Cardium, with strong drilling (17 gross wells) on our newly acquired Pembina Cardium acreage. Drilling for Deep Basin Spirit River and Montney remains positive, and four wells were drilled for East Shale Basin Duvernay on our acreage. Our top payors continue to represent some of the most well capitalized E&P companies in Canada. Below are details of some of the changes made to our key operating assumptions for 2018 based on results for the first quarter and expectations for the remainder of the year. We are maintaining our 2018 average production range to 11,750-12,250 boe/d. Volumes are expected to be weighted approximately 55% oil and natural gas liquids (NGL) and 45% natural gas. We continue to maintain our royalty focus with royalty production accounting for 93% of forecasted 2018 production and 99% of operating income. We are revising our WTI oil price assumption to US$65.00/bbl (previously US$60.00/bbl). Our AECO natural gas price assumption has been reduced to $1.75/mcf (previously $2.00/mcf). Based on our current $0.0525/share monthly dividend level, we expect our 2018 adjusted payout ratio ((cash dividends plus capital expenditures)/funds from operations) to be approximately 54% (previously 61%). The expectation of our longer term payout ratio remains cautious as the market is showing future light oil prices below current levels. General and administrative costs remain at $2.50/boe even though costs for the first quarter were $3.60/boe. G&A expenses are typically higher in the first quarter and decline through the remainder of the year, as a number of annual expenses occur early in the year. We have reduced our forecast year-end net debt to funds from operations to approximately 0.3 times (from 0.4 times) due to increased oil price expectations. A conference call to discuss financial and operational results for the period ended March 31, 2018 will be held for the investment community on Thursday, May 10, 2018 beginning at 7:00 am MT (9:00 am ET). To participate in the conference call, approximately 10 minutes prior to the conference call, please dial 1-800-806-5484 (toll-free in North America). Freehold's 2018 first quarter interim unaudited condensed consolidated financial statements and accompanying Management's Discussion and Analysis (MD&A) are being filed today with Canadian securities regulators and will be available at www.sedar.com and on our website at www.freeholdroyalties.com. Freehold Royalties Ltd. has released second quarter results for the period ended June 30, 2018. (3) Note the conversion of natural gas to barrels of oil equivalent (boe). "With oil prices continuing to display strength, our funds from operations per share grew by 7 per cent from first quarter to second quarter, and we are forecasting an adjusted payout ratio for 2018 near the lower end of our target adjusted payout range of 60 per cent to 80 per cent. We will continue to monitor commodity prices and allocate free cash flow in ways that maximize shareholder value. "On the activity front, drilling on our royalty lands came in slightly below expectations; however, the second quarter typically represents a period of reduced activity. We are maintaining our 2018 production forecast between 11,750 and 12,250 barrels of oil equivalent per day, and we continue to position Freehold as a high-quality investment in oil and gas with low debt, sustainable dividends and an attractive yield. "President and chief executive officer"
The board has declared a dividend of 5.25 cents per common share to be paid on Sept. 17, 2018, to shareholders of record on Aug. 31, 2018. The dividend is designated as an eligible dividend for Canadian income tax purposes. Freehold's royalty production averaged 11,052 barrels of oil equivalent per day, nearly flat versus second quarter 2017 and first quarter 2018. Volumes were impacted by acquisitions completed in first quarter 2018, the strength of the company's audit function (approximately 380 boe per day of prior-period adjustments) and third party drilling on the company's lands. Royalty interests accounted for 94 per cent of total production and contributed 100 per cent of operating income in second quarter 2018, representing all-time highs for Freehold. Funds from operations totalled $34.5-million, an increase of 9 per cent compared with second quarter 2017. Higher funds from operations were driven by better oil and natural gas liquids (NGL) prices and lower cash costs. On a per-share basis, funds from operations were 29 cents per share in second quarter 2018 up from 27 cents per share in both second quarter 2017 and first quarter 2018. Freehold generated $15.1-million in free cash flow (1), over and above the company's dividend, which Freehold applied to outstanding debt. At June 30, 2018, net debt totalled $77.9-million resulting in a net debt to 12-month trailing funds from operations ratio of 0.6 times. Freehold closed a $2.7-million royalty acquisition in second quarter 2018. The transaction included a 3-per-cent gross overriding royalty on a 21-per-cent working interest on the Mitsue Gilwood sands unit No. 1. Annualized 2018 production and operating income associated with this asset is estimated to be 16 barrels per day and $400,000. Wells drilled on the company's royalty lands totalled 85 (1.2 net) in the quarter compared with 58 (1.6 net) in second quarter 2017. The second quarter typically represents a period of slower drilling on the company's lands as spring breakup occurs, slowing operations. For the year, 324 gross (7.6 net) wells have been drilled. In second quarter 2018, Freehold issued 18 new lease agreements with 10 companies, compared with 42 issued in first quarter 2018 and 12 leases in second quarter 2017, highlighting the success of the company's leasing team. Year to date (YTD), the company has completed 60 new lease agreements on the company's royalty lands. Since the inception of the company's leasing team in January, 2017, the company has completed 161 new lease agreements. Cash costs (1) for the quarter totalled $5.17 per boe, down from $5.63 per boe in second quarter 2017. For 2018, the company is forecasting cash costs of approximately $5 per boe. Dividends declared for second quarter 2018 totalled 15.75 cents per share, up 5 per cent versus the previous year. In March, 2018, Freehold announced an increase to its monthly dividend from five cents to 5.25 cents per share commencing in April, 2018. Basic payout ratio (1) (dividends declared from funds from operations) for second quarter 2018 totalled 54 per cent while the adjusted payout ratio (1) (cash dividends plus capital expenditures from funds from operations) for the same period was 56 per cent. Below are details of some of the changes made to the company's key operating assumptions for 2018 based on results for the first half of the year and expectations for the rest of the year. The company is maintaining its 2018 average production range of 11,750 to 12,250 boe per day. Volumes are expected to be weighted approximately 54 per cent oil and NGL and 46 per cent natural gas (previously 55 per cent and 45 per cent, respectively). The company continues to maintain its royalty focus with royalty production accounting for 94 per cent of forecasted 2018 production and 99 per cent of operating income. As part of continued weakness in equity markets and depressed prices associated with natural gas, the company reduced its 2018 drilling forecast from 25 to 20 net wells. The company is maintaining its WTI (West Texas Intermediate) oil price assumption of $65 (U.S.) per barrel but has increased its WCS (Western Canadian Select) oil price assumption to $55 per bbl (from $53 per bbl) as second quarter 2018 heavy oil differentials were lower than expected. The company's AECO (Alberta Energy Company) natural gas price assumption remains unchanged at $1.75 per thousand cubic feet. Even though market prices are slightly lower, there have been significant AECO price fluctuations, so a change was not yet justified. Based on the company's current 5.25-cent-per-share monthly dividend level, the company expects its 2018 adjusted payout ratio (cash dividends plus capital expenditures from funds from operations) to be approximately 55 per cent (previously 54 per cent). The expectation of the company's longer-term payout ratio remains cautious as the forward commodity market is showing future light oil prices below current levels. General and administrative costs remain at $2.50 per boe. The company has increased its forecast year-end net debt to funds from operations to approximately 0.4 times (from 0.3 times) due to acquisitions completed year to date, changes in working capital and a slight increase in gas production relative to oil production. A conference call to discuss financial and operational results for the period ended June 30, 2018, will be held for the investment community on Aug. 3, 2018, beginning at 7 a.m. MT (9 a.m. ET). To participate in the conference call, approximately 10 minutes prior to the conference call, please dial 1-800-806-5484 (toll-free in North America), participant access code 6624442 followed by the number sign. Freehold's second quarter 2018 interim unaudited condensed consolidated financial statements and accompanying management's discussion and analysis are being filed today with Canadian securities regulators and will be available at SEDAR and on the company's website.